I don't know about you, but one of my pet peeves with electronic products is all the technical sounding language they use, which makes it very hard to understand and compare the products for average Joe. Usually you buy and then discover later why the product is good or some lacking feature you needed but didn't realise at the time. In this article I am going to help you to choose the best double din head unit, even if you are not a techie! What's a Double Din Head Unit? Before we go any further let's first clarify what a double din head unit is. Basically, this is an electronic unit that is fitted into the stereo part of your vehicle. In the good old days this would have played tapes, CD's and the radio. These days technology is storming ahead and most double din head units are also storming ahead with all kinds of marvellous features (read on... more coming about the awesome features further down). A double din means the part of the unit which slots into the stereo cavity measures 4" by 7". A single head unit will only measure 2" by 7". Importantly you need to check your vehicle. If you only have room for a single head (2" x 7 ") you will need to buy a single din rather than a double din. If you have space in the vehicle for a double din (4" x 7") then hooray we are all set! These days double din head units are all singing, all dancing techie marvels. Here are just some of the awesome things they can do (other than play music, like)! How Do I Know the Unit Will Improve the Quality of Sound I Get from My Sound System? The key to answering this question is RMS Watts. If you want the best quality of sound then you need to look for a product with a high RMS Watts feature. 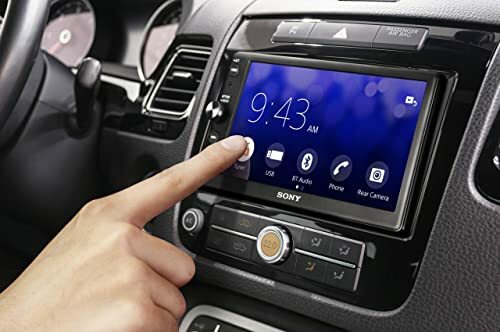 Importantly you need to check the devices you want to connect to your double din and check they will be compatible with the devices you already own. While most units are very good these days and are able to connect to a number of different devices, they are not always compatible. 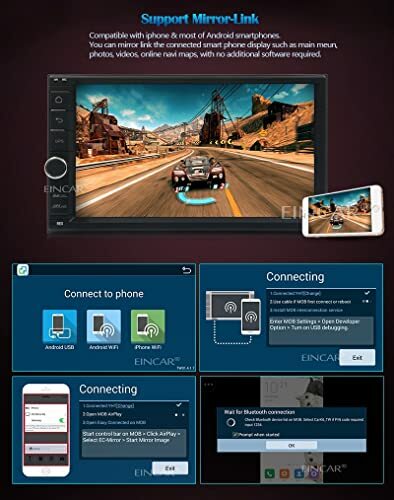 Bluetooth – the easiest way to connect various devices to the head unit without leads. Another factor to consider is most units will now have a touchscreen. The important thing here is to choose an "android" screen because this means you will find the screen as responsive as your smartphone. You need to bear in mind the method of connecting the head unit to the internet should you wish to. You may need to get a special internet dongle (USB with an internet sim card inside), use the internet from your phone, or you can usually connect using WIFI in the area... WIFI in the area is not guaranteed though, so consider what the other options are too when you are choosing your product. Next, I would like to discuss five great products, which I have chosen to review and some of their highlights and downsides. You may need to purchase a lead separately to connect your device. 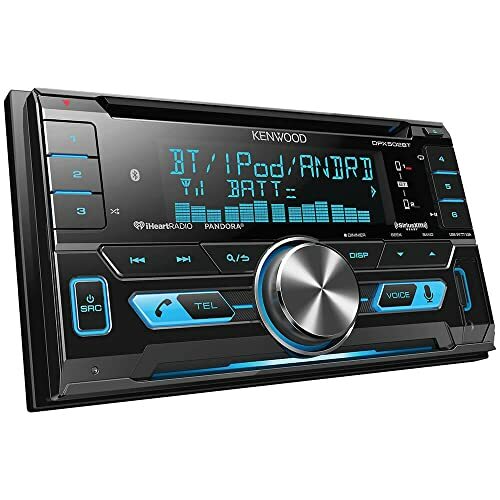 This very satisfactory mid-range double din head unit offers a very good "all round" adaptable and quality system. You can still play your CD's (don't worry we won't tell) and of course DVD's can be played as well. With 14 RMS Watts the unit should make a difference to the quality of your sound output. ​Connection to an iPhone or iPod is easy using special cables (CD-IU51 interface cable for 30-pin devices or CD-IU52 interface cable for Lightning devices), devices that use 30 pins a special cable can also be used to connect (CD-IU201V interface cable) – they are not supplied though, which is a minor annoyance, even though it is less wasteful than supplying all three cables with each unit. Bluetooth can also be used to sync various devices and phones. Hands free calls can be taken and made. 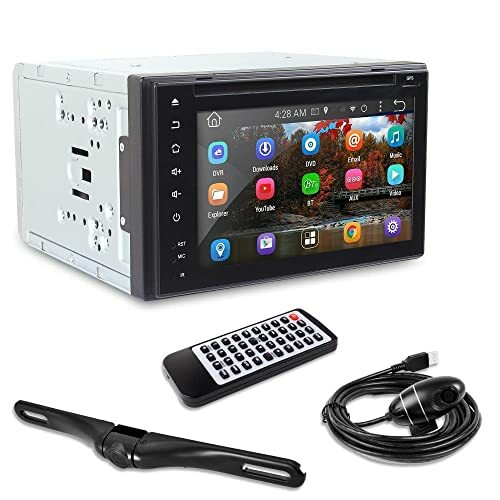 The device can play a wide range of different media files and should suit a lot of people even if you have lots of different types of media you want to play when you are in your car. This product is a good option if you are on a budget. You don't have the all singing all dancing touchscreen and you cannot play video's. However, the price is low, which reflects those missing features. The focus of the product is on music therefore, there is an excellent radio, you can play CD's, and other forms of music in various media forms for example,MP3/WMA/AAC/WAV/FLAC will all playback via USB. The RMS is high at 17 watts so this is a very good choice if your priority is sound quality. You can connect to the unit with the USB input (x 2) and the unit is compatible with Apple iPhone 6/6+ and iOS 8 software. There is a Bluetooth connection for taking hands free calls and will work with most phones as long as they have Bluetooth. This makes the unit very flexible and will suit a wide range of people. Plus, I like this unit because it is pretty... It looks like a kind of flash 90's stereo system and somehow, I really like that! Doesn't play video's or have a touchscreen. You know those double din stereos' I mentioned earlier, which are all singing, all dancing! Well this is one of those products. If you are looking for a high-end product with lots of features this will be a good choice for you. There is a high-quality touchscreen, which enables playing videos, with a large 16mb storage facility to allow for this. There is basically an android computer inside the product and this powers the screen, and other features, making the stereo much more than just a stereo. You can use the internet connection (using WIFI) to download apps from google play and to browse the net. There is a built in satnav system that uses Google maps, a SD card is included with North American maps already loaded onto it. The unit comes with a rear mounting camera that you set up and then you can have better visibility when reversing. The unit will connect through Bluetooth to most up-to-date devices, including iPad and iPhones. Of course, you can also answer your phone hands free. If you have your eyes on the future, want more than just a stereo and you have all your music on devices that can be connected to the product, this will make an excellent choice for you. Will play a good range of media files in various formats. High end price, may not suit every budget. This is not the cheapest product on the market however, you are getting a strong brand product, which feels reliable and oozes quality. The design of the product is very stylish and to boot with 17 RMS watts you can be sure you are going to notice a big improvement when you play music. This is not a product that takes CD's so for us "dinosaurs" out there that still use and own CD's this product is not for you. The unit can be used with iPhone and Android both connected with a lead to the unit. There is a USB port as well for connecting devices. If you have a rear camera (or buy one) you can connect it up to the unit and it will work. The camera is not provided with the product. For people who want to optimise using their stereo with hands free and who also want a quality product with a lot of modern innovative features this will make a sound choice. This double din head unit has a very competitive price and the style of the product looks good too. There are also a lot of useful features. The touchscreen is high quality, meaning that using it will be equal to your smartphone, responsive and fast. There is an android computer inside the device and the computer powers features like the Google play and a satnav with preloaded North America maps. If you don't want to break the bank but you also want an all singing dancing unit with eyes to the future (no CD's) then this will be a very satisfactory buy. You connect to the internet with the built in WIFI receiver, you can also use a dongle (USB with internet sim card) to connect to the internet. You can browse online, download apps, and access other online content as per other tablet devices. The Bluetooth can connect to phones, including the iPhone and other android devices. Basically, most devices with Bluetooth can be paired. The unit supports streaming music from the Bluetooth or listening to the Radio while you are using the GPS to navigate. Android phones can be connected via "Mirroring" or you can connect your Android phone by USB cable. iPhone can be connected to the unit via the WIFI. One downside you need to be aware of is this product CANNOT be connected to an iPod. Satnav with preloaded North America maps. 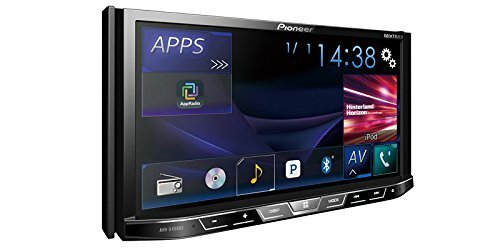 From all these excellent products I think my favorite has to be #1 the Pioneer product. I like the way the product looks to the future with a lot of modern techie features, yet still has a foot in the past so you can still play those CD's you own. Not to mention the DVD's. Which is your favorite from the five products I have chosen? Are you a techie dinosaur or leaping into the future... or in other words do you want the CD slot or not? Let us know in the comments! Previous Post Best Commercial Pressure Washer 2019- A Quick Guide and Reviews Next Post Which Is The Best Travel System Stroller 2019?